This is another salad I made for our little 4th of July BBQ. It was quite tasty. It showcases many summer fruits and vegetables. You could easily mix this up and substitute with fruits and veggies you like. Keep in mind, whenever you add fresh avocado to a salad, it will begin to brown quickly. I recommend eating this salad within 24 to 48 hours of making it. This recipe was adapted from the Clean Food cookbook. NOTE: This recipe actually called for sprouting the quinoa first, and then serving the salad with the sprouted kernels. I chose to just serve it as a cooked grain, as I didn’t feel like prepping it in advance. 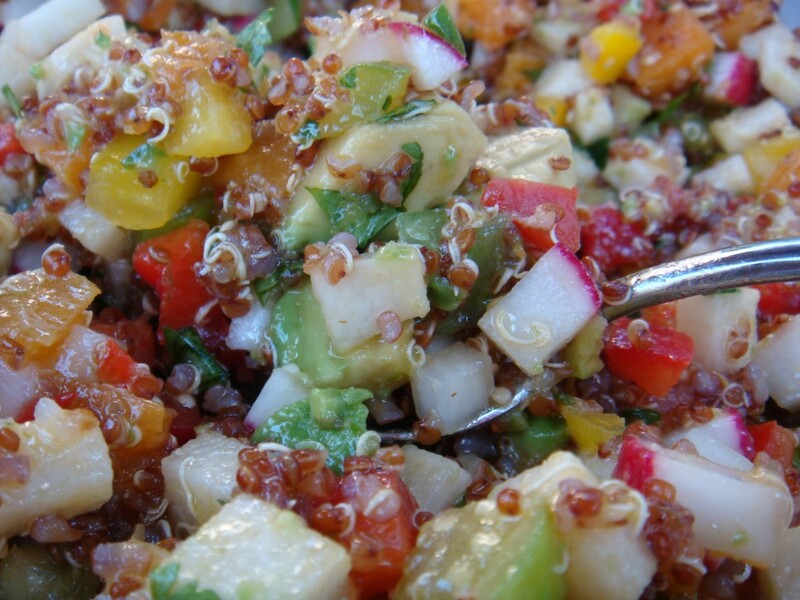 In a large bowl, combine quinoa, jicima, avocado, apricots, tomatillos, strawberries, peppers and radish. In a separate bowl, whisk together dressing ingredients. Pour over salad, toss to combine and refrigerate. Serve cold. I served this salad with grilled chicken and a few other salads, including a Grilled Bread and Tomato Salad and a Cucumber, Mango and Chickpea Salad.